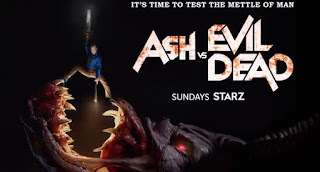 Under the guidance of new showrunner Mark Verheiden, the third season of Ash vs. 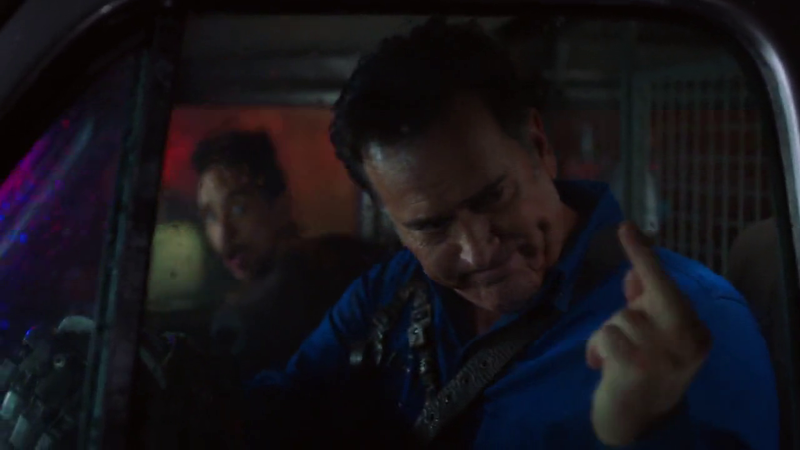 Evil Dead was meant to delve further into the mythology that was established by Sam Raimi's trilogy of Evil Dead films, while also working in more "genuine horror" than had been seen in the previous two seasons - the idea being to bring the show closer to the comedy/horror level of Evil Dead II than the extremely goofy Army of Darkness. While making my way through the season's episodes, I have been very impressed by how Verheiden and the shows writers and directors have achieved those objectives. In Evil Dead II, there was a moment in which a ghostly apparition appears to franchise hero Ash Williams (Bruce Campbell) and his cohorts, begging them to save its soul. Ash makes the unusually astute observation that the tormented spirit appeared to be "something trying to force its way into our world", and with the episode 'Rifting Apart' Ash vs. 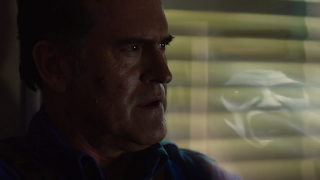 Evil Dead decides to take us into the purgatory-esque rift between time and space that the spirit was inhabiting, introducing the idea that anyone who dies at the hands of this series' evil forces doesn't go directly to Heaven or Hell. 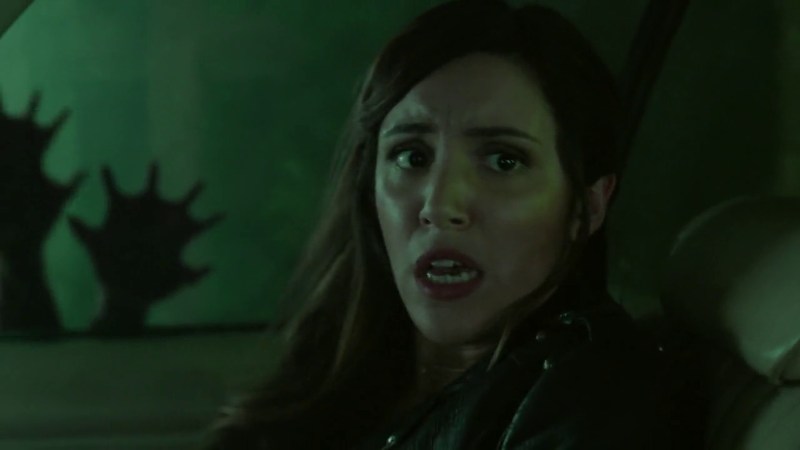 Instead, they hang out in a green-tinted, twisted version of the area they were killed in, where they are stalked by a dark figure and attacked by strange creatures. The allies Ash has lost over the course of this season are now in this "dead land" - Kelly Maxwell (Dana DeLorenzo), "Knights of Sumeria" member Dalton (Lindsay Ferris), Ash's recently discovered teenage daughter Brandy Barr (Arielle Carver-O'Neill), all present and accounted for. Ash has grown quite attached to Kelly during their seasons of adventures together, and during his brief time with Brandy he has already become a protective "papa bear" to his daughter, so he takes shockingly drastic but awesomely heroic measures to rescue them from this limbo. He kills himself so he can join in the dead lands and rescue them, hoping his buddy Pablo Simon Bolivar (Ray Santiago) will be able to pull them out of the rift now that he's gifted with special witch doctor powers. Yes, Ash dies in this episode, but don't worry. His death is about a permanent as those suffered by Jason Voorhees in Friday the 13th: The Final Chapter (and Jason Goes to Hell: The Final Friday) or by Freddy Krueger in Freddy's Dead: The Final Nightmare. 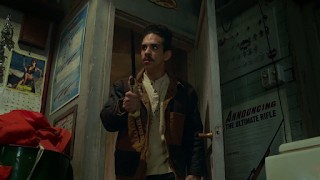 The dead lands are quite a darkly horrific place, and Pablo doesn't seem too safe while waiting by the mystic passageway in the cellar of Ash's hardware store. 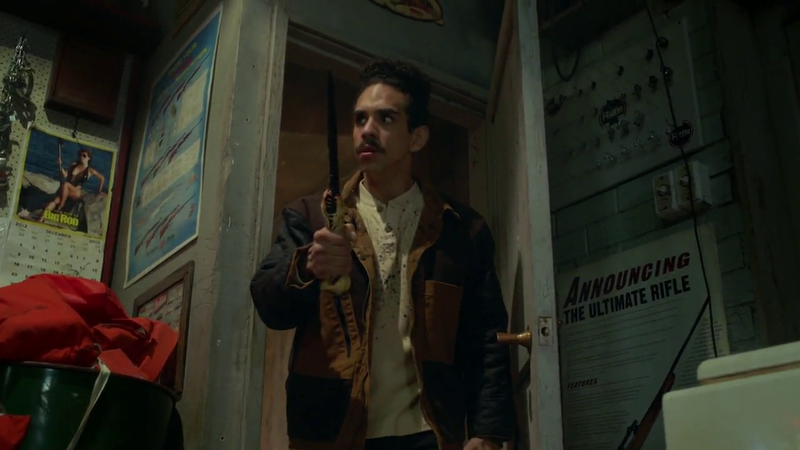 There's even a moment where Pablo notices something strange in the store and goes quietly walking through the place while holding the Kandarian Dagger first introduced way back in the original Evil Dead film. That's as genuine horror as it gets. Scripted by Bryan Edward Hill, who made his writing debut collaborating with Dolph Lundgren on a film titled The Russian Specialist (a.k.a. The Mechanik), 'Rifting Apart' is a great example of what Verheiden wanted to do with Ash vs. Evil Dead, and I really appreciate both the attempt to make the show more horrific and the dedication to epanding the mythology. I have been very happy with the approach Verheiden took to this season. Director Mark Beesley earned his sixth directorial credit on Ash vs. Evil Dead with this episode; he previously directed the season two episodes 'Trapped Inside' and 'Delusion' and the season three episodes 'Family', 'Booth Three', and 'Twist and Shout'. He has done great work on this show, and his episodes stand out as some of the best.